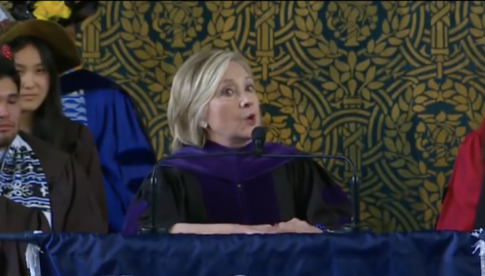 Hillary Clinton acknowledged she's "not over" her 2016 presidential election loss to President Donald Trump during an address Sunday at Yale University's Class Day. She joked about some of her coping methods for her surprising defeat, such as doing yoga and alternate nostril breathing. "No, I’m not over it," Clinton said. "I still think about the 2016 election. I still regret the mistakes I made. I still think though that understanding what happened in such a weird and wild election in American history will help us defend our democracy in the future." "Today, as a person, I’m OK, but as an American, I’m concerned," she added. Taking a jab at Trump's fitness for office, Clinton told the graduates that, even with their Ivy League pedigree, they would fail at some point.